German scholar; born in Frankfort-on-the-Main 1804; died there Sept. 6, 1889. For some time he was shoḥeṭ in the Orthodox congregation of Samson Raphael Hirsch in Frankfort, in which city he spent his whole life. He assented to the protest of the seventy-seven Orthodox rabbis against the decrees of the Rabbinical Conference at Brunswick (1844), and attacked in an open letter ("Offener Brief," 1845), signed "K—m," A. Adler, rabbi of Worms. When Abraham Geiger became rabbi at Frankfort, Kirchheim developed into a radical partizan of Reform. He had then to give up his position as shoḥeṭ, but being a partner in a banking firm he had ample means. Kirchheim was of a pugnacious disposition and took a very active part in the general attack on the Amsterdam administration of the Ḥaluḳḳah in 1843-44, which was especially directed against Hirsch Lehren of Amsterdam, president of the board of administration (see "Orient," iv. 391 et seq.). Kirchheim severely criticized Samson Raphael Hirsch's "Der Pentateuch" in a pamphlet entitled "Die Neue Exegetenschule: Eine Kritische Dornenlese" (Breslau, 1867). Kirchheim published: S. L. Rapoport's "Tokaḥat Megullah, Sendschreiben an die Rabbinerversammlung zu Frankfurt-am-Main" (Hebr. 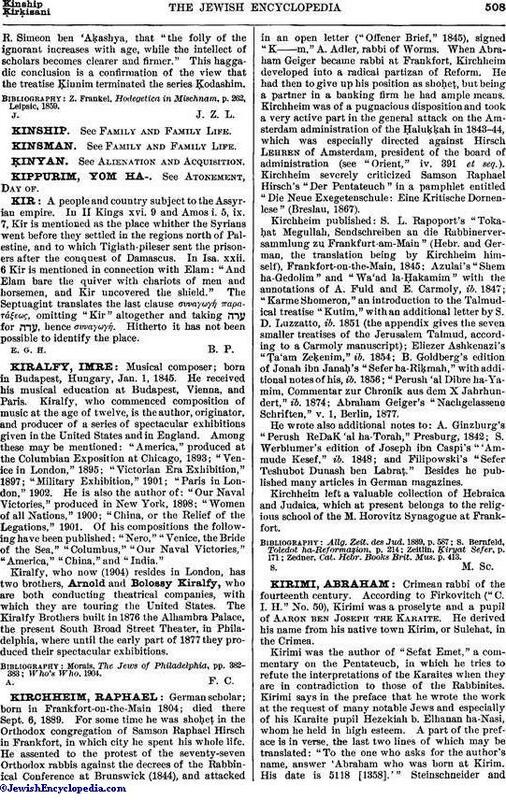 and German, the translation being by Kirchheim himself), Frankfort-on-the-Main, 1845; Azulai's "Shem ha-Gedolim" and "Wa'ad la-Ḥakamim" with the annotations of A. Fuld and E. Carmoly, ib. 1847; "Karme Shomeron," an introduction to the Talmudical treatise "Kutim," with an additional letter by S. D. Luzzatto, ib. 1851 (the appendix gives the seven smaller treatises of the Jerusalem Talmud, according to a Carmoly manuscript); Eliezer Ashkenazi's "Ṭa'am Zeḳenim," ib. 1854; B. Goldberg's edition of Jonah ibn Janaḥ's "Sefer ha-Riḳmah," with additional notes of his, ib. 1856; "Perush 'al Dibre ha-Yamim, Commentar zur Chronik aus dem X Jahrhundert," ib. 1874; Abraham Geiger's "Nachgelassene Schriften," v. 1, Berlin, 1877. He wrote also additional notes to: A. Ginzburg's "Perush ReDaK 'al ha-Torah," Presburg, 1842; S. Werblumer's edition of Joseph ibn Caspi's "'Ammude Kesef," ib. 1848; and Filipowski's "Sefer Teshubot Dunash ben Labraṭ." Besides he published many articles in German magazines. Kirchheim left a valuable collection of Hebraica and Judaica, which at present belongs to the religious school of the M. Horovitz Synagogue at Frankfort. Zedner, Cat. Hebr. Books Brit. Mus. p. 413.